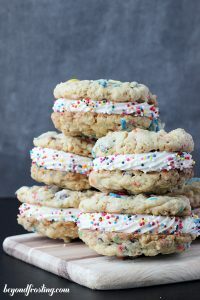 Samoa Cookie Sandwiches - Chocolate Chocolate and More! 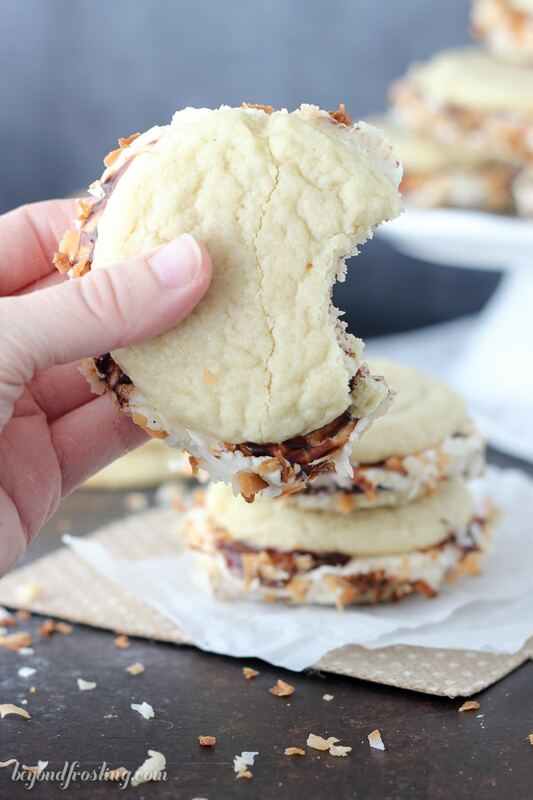 These Samoa Cookie Sandwiches could not be any better! 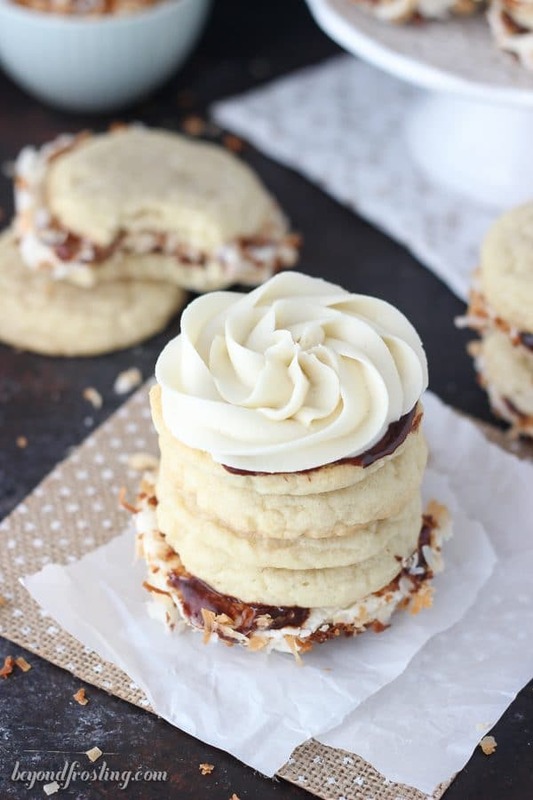 Buttery sugary cookies, caramel frosting, chocolate sauce and toasted coconut. Here we are approaching the end of January. Are we done with all the healthy eating yet? Don’t get me wrong, I don’t mean to damage your diet, but these cookies are a necessary cheat. I mean treat. See what I did there? If you are anything like me, then you look forward to this time of year because you know it means Girl Scout Cookies. Tell me, do you have a favorite? I have SUCH a hard time deciding. I can never turn down a Thin Mint, and I am often fighting for the last Samoa cookie. Then there are the Peanut Butter Patties; you know I am not sharing those! I know you can get very similar cookies at Walmart or whatnot, but it is just not the same. Since I don’t have access to samoa cookies all year around, I’ve started making samoa- inspired desserts to curb my cravings. If you were to search Samoa on my blog, you would find things like this dip, or even a no-bake icebox cake. 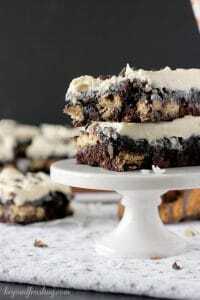 Best of all, you would find this Sinful Samoa Cake. I’m back today with my first Samoa dessert of the year. 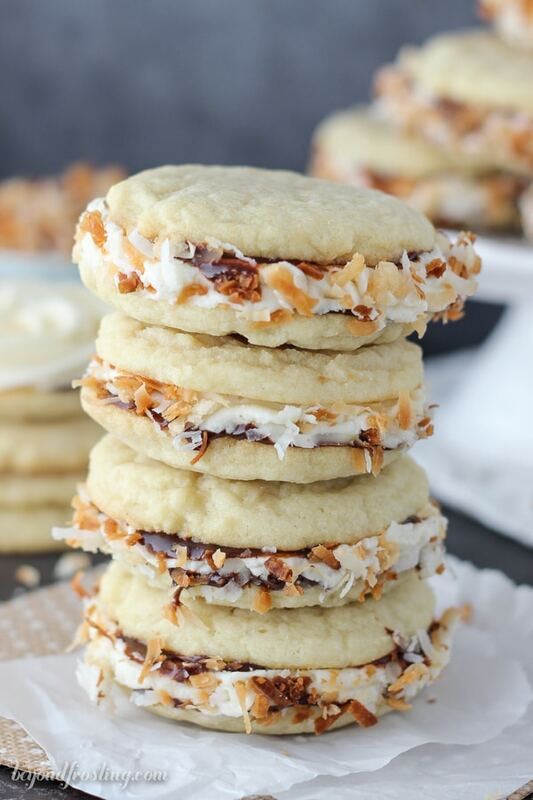 These Samoa Cookie Sandwiches are a must-make. Do you remember last month’s Perfect MnM Cookies? Well this starts with the same base cookie recipe. It’s everything that is inside of this cookie that makes it extra special. In between these cookies, you’ve got a layers of hot fudge sauce and caramel frosting. Then they are finished off with toasted coconut. You only need a thin layer of hot fudge. I warmed a jar of hot fudge sauce for about 30 seconds in the microwave. It needs to be easily spreadable, but not very hot. To add the frosting, I used a 1M tip. Start frosting from the outside of the cookie and into the middle. You might have a little leftover frosting, but since when has that been a bad thing? 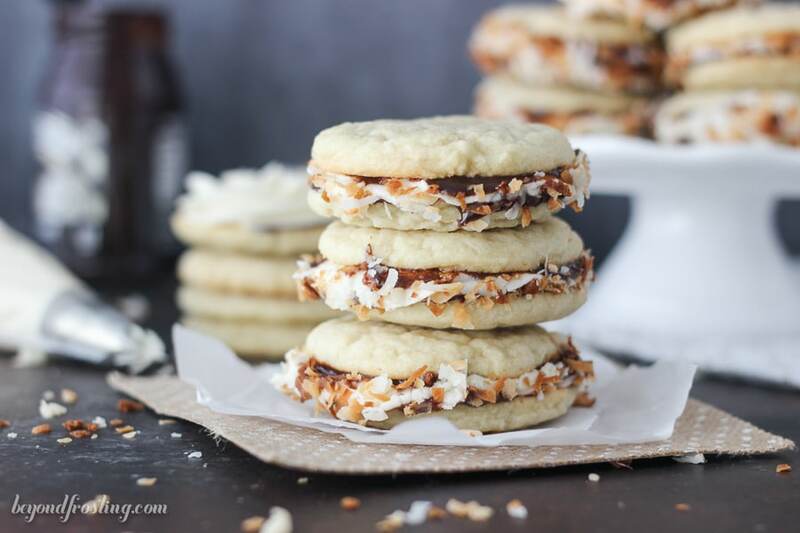 Once you sandwich these cookies together, roll them in toasted coconut. You may need to press the coconut into frosting a little bit to get it to stick. These cookies are a bit on the sweeter side, but that’s okay with you, right? Good. Combine butter with sugar and beat on medium speed until well creamed together. Add egg and vanilla extract. Mix into butter and sugar until egg is well beaten. In a separate bowl, combine flour, baking soda and cream of tartar. Slowly add into batter and beat on medium low speed until well combined and dough forms. Refrigerate dough for a minimum of 30 minutes and up to 1 hour. Do NOT skip this step or you will have cookies thinner than pancakes! Preheat oven to 350° F. Use a medium cookie scoop (1-2 tbsp) and scoop cookie dough onto a parchment paper lined baking sheet. Place about 2 inches apart. Bake at 350° F 10-12 minutes. Allow cookie to cool on the baking sheet for several minutes and then transfer to a wire rack to cool completely. While cookies are baking, toast coconut on a second baking sheet lined with parchment paper. Keep an eye on the coconut while baking. It need less than 10 minutes. Put on a paper plate to cool. Allow butter to come to room temperature. Using a stand mixer, beat the butter for several minutes until light and fluffy. Add powdered sugar one cup at a time and slowly increase speed from low to medium. As the frosting becomes thicker, slowly add caramel sauce and milk, one tablespoon at a time. Gradually increase speed to medium high; beat for several minutes until light and fluffy adding a pinch of salt to cut the sweetness. Fill a large piping bag that is fitted with a 1M tip. Set aside. To assemble the cookies, first heat a jar of hot fudge for 30 seconds so that it is spreadable but not hot to the touch. 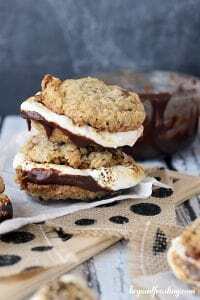 Spread a thin layer of hot fudge sauce on the backside of the cookies. On the backside of one cookie, pipe a layer of caramel frosting using a 1M tip, starting from the outside edge and working you way in. Add a second, hot fudge frosted cookie on top. 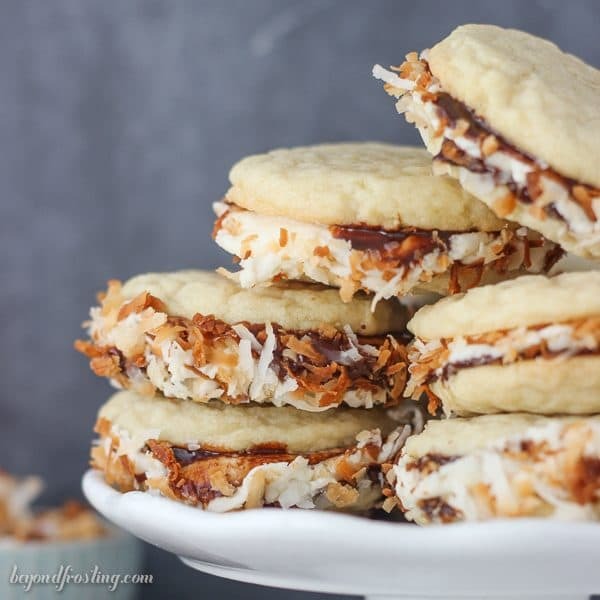 Gently roll the cookie in the toasted coconut. You can use your hands to press the coconut into the frosting as well. These cookies look really good! Thanks for the recipe. We hope you like them Vickie!